I think that I will change my old vacuum and I will replace it with a new one. I thank chowpups for the tip. Totally satisfied with my new vacuum and it does a fantastic job. I thank chowpups. Glad you like it I love it! My old Hoover just packed it in and I bought the Shark Navigator Pro (the all white one, a little smaller than the Rotator) and I love it. It is light weight, has excellent suction and I love the swivel head for getting in tight spots. Sounds like this little shark is a winner so far.. LOL the little things in life that make us happy ..
We have a Dyson with a power head and it works well. 1-2 takes over a hair ridden rug and its clean. Hi. New to the group and this is my first post, but I wanted to add to this topic. Our Chow and our Border Collie mix were too much hair for our Hoover Wind Tunnel. So we broke down and purchased the Dyson DC 41 Animal Vac. The first use impressed the heck out of us by what it picked up from carpets/rugs already supposedly cleaned by the Hoover. I love the clear canister and empty it frequently while cleaning as it does a great job of picking up the dog hair and other debris, quickly filling with hair, much of which isn't obvious to us on the mottled design of the carpet in some areas. The power of the vacuum kind of scared me on first use. I was using the crevice tool, attempting to clean a corner. Shocked to realize that the vacuum wand could LIFT the entire section of carpet as the suction was so strong. I've had to clean (as in cut the hair from off of) the beater bar a couple of times. We've had the vacuum a couple of years now (and the Chow about 3). VERY pleased. I appreciate all of the information I'm finding here about Chows. No one else I know has a Chow. Ours is a sweetheart and it's valuable to me to read comments from others just as smitten with the breed. How can you say that your chows are sweetheart? 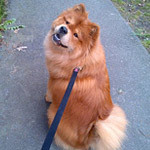 Everyone here those who have chows love them very much.I too have a chow of Chinese breed.The bestir breed I bought.If you want to see you can nisit here.And for cleaning i also use the carpet cleaning vacuum machine.It keeps him away from dirt always. I have only had it a month, but am very pleased so far. RhondaR wrote: I currently have a hoover mach 5. But it was getting less powerful even before Bubba came into our lives and now I have to clean out the beater bar and the bristles and the hoses everytime I want to vacuum. There are only three area rugs in my house so its not like I have wall to wall carpeting that I am trying to vacuum. But this vacuum just can't handle all Bubba's fur. I know when it comes time for him to shed his winter coat there is no way that vacuum will work. Any suggestions? I don't have the funds to buy the Dyson. I would like to share my experience with BISSELL ZING BAGLESS CANISTER VACUUM .I have two pet dogs at home. They always keep on moving around the house shedding hair. Its a real mess cleaning the pet hair unless you have a vacuum cleaner with strong suction pump.Currently i own a BISSELL ZING BAGLESS CANISTER VACUUM and its doing a good job till now.Picking the fine pet hairs or removing dirt from drapes,it does everything so efficiently.Does't clogs.It has an automatic retracting cord which makes it flexible much needed for household cleaning. And at last i bought it. I can say that it is working fine for me. The Dyson Animal vacuum cleaner does wonders on my carpets with my 2 furballs, and BooBoo loves to get vacuumed. Really. He's not scared, and when I vacuum him with the handheld attachment, he wiggles from left to right. No wonder I love this breed. They do the most amusing, charming, goofy antics, and are so darn cute! I have 2 Chow Chows- So twice as much fur but I also get twice the loving/ But getting back to a vacuum. After trying several, I purchased a Sebo from Amazon- Quite expensive but it has lasted me almost 2 years with the constant vacuuming.You do have to change the bags about every other weeks and clean the brushes. I also use Bissel Perfect Sweep Turbo that is battery operated. These also have to me cleaned often.I use these thru out the day when I don't want to get the big one out. I just look at it as the price of all the love I get. Before I had the Sebo, I had an Oreck but it was not as efficient in capturing the dog hair. 1. Try not to Make It Harder. 4. Change the Bag/Empty the Canister. 6. Expel Small Objects From the Floor. 7. Move the Furniture Occasionally. I have been raising chows one at a time for over 30 years, this is my 4th chow baby, The best vacuum I have ever had was a Shark. I have 1 chow and 2 pit mixes one of them is a Lab/Pit mix and the shedding that goes on with that one make the chow look like he never sheds lol. I get my chow groomed monthly so that may be why he seems ton not shed as much as the Lab/Pit mix. I have the Shark Rotator lift away and have used this for years. This is my second of the same name because I gave the old one to my daughter when she moved out. It is a bagless and goes from floor to carpet effortlessly and has amazing suction. For the price point it is worth giving it a try. I agree on the Shark! The Shark Navigator Professional is the best vacuum ever! I too have owned Chows for 30+ years and what seems like a million different vacuums. It works on carpets and hardwoods equally well. Pets are the best companions of a human being. And if you have a pet at your home you are surely going to find a bunch of extra hairs at your home and cleaning them is really a big challenge for you. Recently I bought "BISSELL PET HAIR ERASER". This is the best vacuum cleaner I ever had. This brand is known to be the perfect combination of power and versatility at an affordable price.